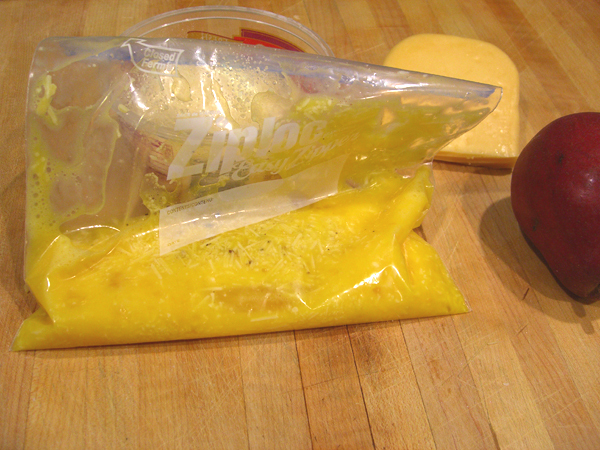 A friend sent me an interesting recipe the other day: boiling an omelet in a Ziploc bag. I like omelets. I happen to think that making an omelet the old-fashioned way isn’t that big a deal. It takes maybe 5 minutes, and gets a pan, a bowl and a plate dirty. But it’s a slow Saturday night, so what the heck. 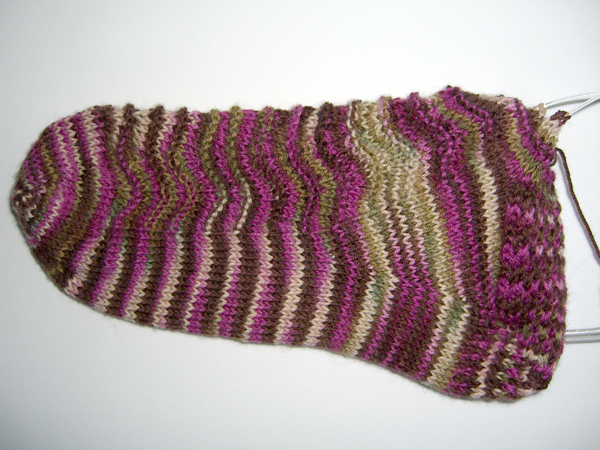 At the very worst, it should be good for some blog fodder, right? So here we have a little tableau I think I’ll call Still Life With Eggs And Ziploc. This is the assembled ingredients for my little experiment: eggs, a couple of kinds of cheese, salt and pepper (not shown). 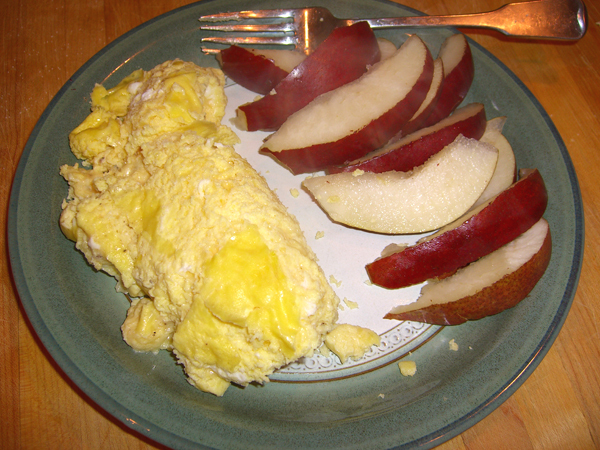 No, the pear doesn’t go in the omelet. It’s there to look pretty and balance the plate. OK? 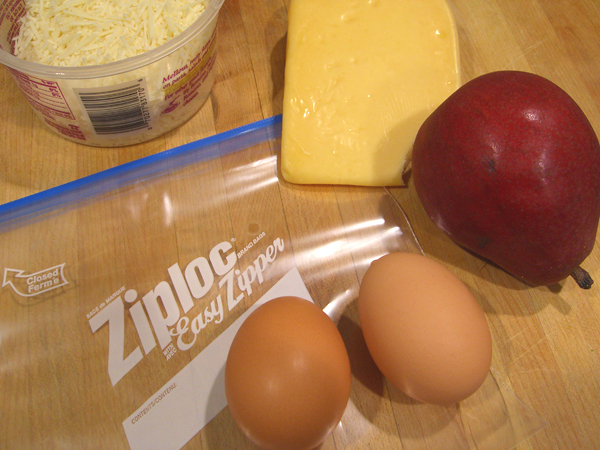 The first step in our breakfast-for-dinner adventure is to break the eggs into the Ziploc bag. The recipe calls for a freezer Ziploc, I assume so that it will stand up during boiling. Poached eggs a la melted plastic. Blech. I decided to follow the suggestion. 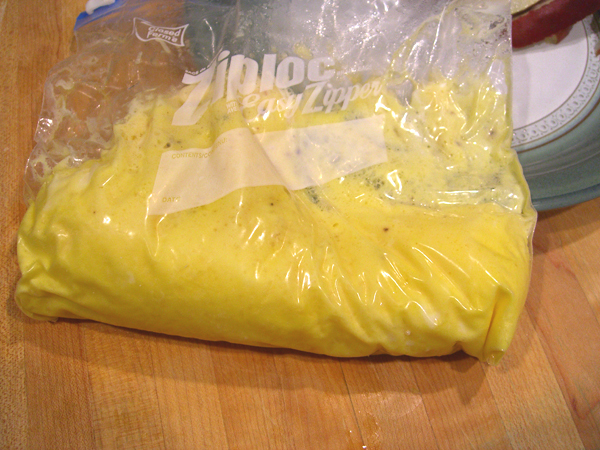 Once in the bag, the eggs are shaken and smooshed until basically scrambled. I then added the cheese and some salt and freshly ground pepper. Because two eggs didn’t look like much in a quart sized Ziploc, I threw in a third egg and smooshed that up with the rest. I squeezed the air out of the bag and sealed it, and then dropped it into rapidly boiling water. Once the bag was boiling away, I concentrated on cutting up my pear and getting the rest of my little dinner ready. The recipe states that the bag should be boiled for exactly 13 minutes. Because of the extra egg, my omelet was still gooshy at that point. I boiled the bag for an extra 3 minutes. That did the trick nicely. 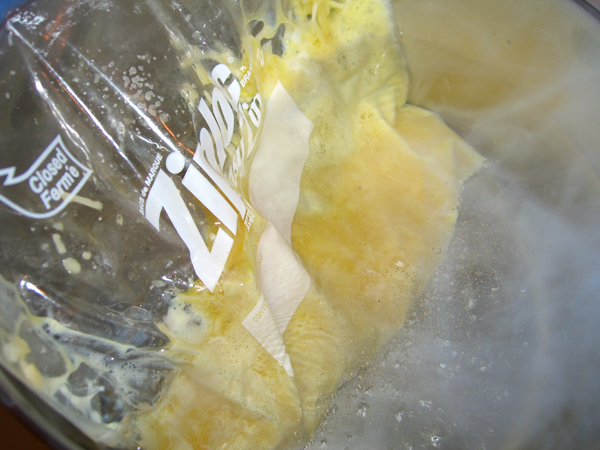 And here is the Ziploc out of its boiling water bath. The omelet is supposed to slide right out. That didn’t happen. I had to sort of tease it away from the sides of the bag with my fork. It was mostly the cheese that stuck. I perhaps should have used less cheese, or maybe a different kind of cheese. Do you think this thing looks like an omelet? More like scrambled eggs, eh? Congealed scrambled eggs. It didn’t taste too bad. Not really like an omelet, but not horrible. (Let’s face it — it’s the butter that I fry my omelets in that adds that yum factor.) It reminded me of microwaved scrambled eggs. The recipe suggests that this would be fun at a party, or if you have a bunch of guests for breakfast. You can turn out several omelets at once by boiling them in a big pot. I can see that it would be a lot of fun if you had a bunch of kids around at breakfast who all liked different stuff in their omelets. Each guest should, of course, use a permanent marker to sign their Ziploc. I’m not sure that I will repeat this particular experiment. 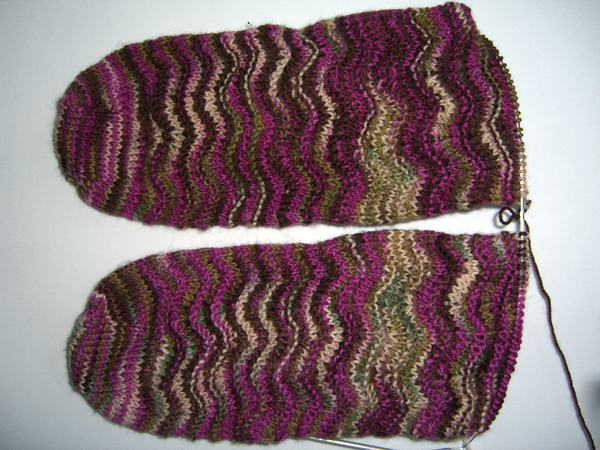 I have to admit the clean-up was easy, but I don’t know that the result was really that great.